LED stands for Light Emitting Diode. It is a two-lead semiconductor light source. It is a pn-junction diode which emits light when activated. It is a very important electronic device because it is used in a lot of electrical and electronic devices now a days. It is mostly used in electronic test equipments, TV's, calculators, watches, radios, etc. When a suitable voltage of electricity is applied to the leads, electrons recombines with electron holes and release energy in the form of photons. This effect is called electroluminescence. 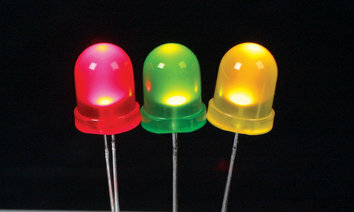 The color of LED's light is determine by the energy band gap of the semiconductor. LED is proved a revolutionary product in the field of light source. Its lamps are very energy efficient, economical and long lasting. As compared to conventional lighting bulbs and fluorescent light sources, it is almost 80% energy efficient. LED requires very less power. For example, LED TVs are more energy efficient than CRT and LCD TVs. LED does not produce heat, so it reduces the cooling loads also. LED does not produce buzzing noises and flickers etc. LED lights are non-toxic. It does not contain mercury, lead or cadmium. The enhanced use of LED lights can reduce carbon emission. With proper installation, the LED can be worked for a long span of time with a very low maintenance cost. LED needs very low maintenance cost. It also require very low recycling charge. LED is recyclable with a very low recycling charges. LED offers better image quality than LCD. LEDs have allowed new text, video displays and sensors to be developed. Due to their high switching rates, it can be also useful in advanced communication technology.